The state of our Yucca whipplei is such an ongoing saga here it even has its own folder in my photo files. I wrote about its impending move back in early 2013 when we had cut the concrete paving in preparation for its move. But it was still in situ this time last year when, after a period of getting on for 20 years, it actually flowered. We were thrilled. As the flower spike edged past the first story of the house, it was a well-documented blooming. But other needs were always more urgent so the moving of the yucca had not taken place. Nor had the windows to what is our TV room been cleaned for many years. But yesterday the day came, forced by the arrival of the glaziers to install retro-fitted double glazing in our wooden window sashes. It was not an easy task. Mark had thought he could probably chainsaw the top off but the fibrous nature of the spent foliage merely jammed the chainsaw. At this point it is in two pieces. The top will be replanted on the sunny bank in the north garden where it will likely recover. The base, with a new rosette well-formed already, will be dug out and also relocated. It will, I tell you it will. I like the garden view out of the windows which is now visible again and while cleaning windows is not my favourite activity, I do like to be able to do it when necessary. As far as we know, this is Yucca whipplei, also known as Hesperoyucca whipplei, chaparral yucca, Our Lord’s candle, Spanish bayonet, Quixote yucca or foothill yucca. So Wikipedia tells me. Apparently the most common name is Our Lord’s candle. It being native to southern America from California through to Mexico, it clearly felt right at home in the bone dry conditions of the house border beneath the eves. In the meantime, Our Lord’s candle is no long alight at our place. I have been forced to extreme remedial action in the rockery in the Battle of the Geissorhiza. Such a pretty weed and so dreadfully invasive. Each bulb is surrounded by many little baby bulbs that peel off as soon as you look at them, ready to grow into the future. In the worst affected pockets of rockery, I am lifting everything and washing the roots to make sure no dreaded geissorhiza bulbs are lurking in there hiding. Then I dig out all the soil and replace it with clean soil. I was surprised that one pocket generates almost a full barrow of soil. The contaminated soil is being dumped in the deepest, darkest shade where I hope nothing will germinate and if it does, as a last resort it can be sprayed. This somewhat extreme and labour intensive treatment should, I hope, get me closer to victory and the extermination of this pretty but hideously invasive bulb. Shun Geissorhiza aspera. It belongs to the same group as highly invasive oxalis or allium-type of Pesky Weeds Masquerading as Pretty Plants. You have been warned. Magnolia Serene is opening. This always heralds the end of the deciduous magnolia season for us as it is the last of the major magnolias here to bloom. Alas, a magnolia season that was progressing magnificently was dealt a near death blow two weeks ago when we had a huge wind which lasted more than 24 hours. We are used to wind here – it is the west coast of the Windy Isles after all (New Zealand being marooned in expanses of vast ocean all round means that we are a windy country) but this was more than an ordinary wind. Reminiscent, in fact, of the worst winds we can remember which came as Cyclone Bola 27 years ago. Fortunately the damage was minor though the debris was great. And the later flowering magnolias were something of a casualty. Because Serene was still in bud, it came through unscathed but the rest of the plants in bloom had their season cut short. This entry was posted in Tikorangi notes and tagged Abbie Jury, geissorhiza aspera, Magnolia Serene, Tikorangi: The Jury garden, Yucca whipplei on 30 September 2015 by Abbie Jury. For us, Serene in full flower heralds the last chapter of the magnolia season each year. It is the latest and the last of the Jury magnolias to flower. It is also the pinkest. This is another of the series named by Felix Jury back in the early 1970s and the original tree now stands around six metres tall and is pyramidal in shape rather than spreading. In full flower, it is just a mass of large rosy pink bowl-shaped blooms. Being so late to flower, Serene is an excellent choice for people in colder areas or prone to late frosts. It also tends to miss the worst of the equinoctial winds. Cold conditions will make the plant adjust to blooming even later but Serene does get its flowers through before its foliage. We are picky here – we want deciduous magnolias to mass flower on bare stems before the new season’s leaves unfurl. When the leaves do come, they are a particularly good deep green and tidy in form so Serene stands out as a good summer foliage plant in a way in which few deciduous magnolias do. It will also set a flush of summer flowers which is bonus territory. Serene was another of the series Felix bred using his wonder breeder parent, slightly embarrassingly named Magnolia Mark Jury. Its other parent is liliiflora. 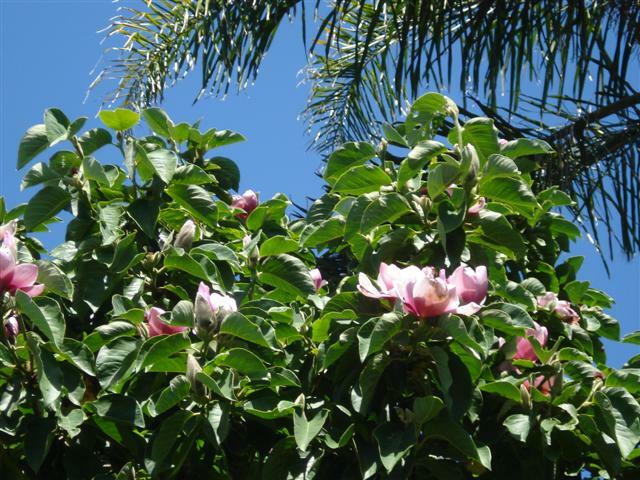 This entry was posted in Plant collector and tagged Abbie Jury, Felix Jury, Jury magnolias, Magnolia Serene, New Zealand magnolias, The plant collector on 24 September 2010 by Abbie Jury. The photograph much admired by radio host and landscaper Tony Murrell on Radio Live this morning was the end of season snap of Serene taken last year. We might equally describe this as a fine example of why you do not plant a magnolia beside your swimming pool although in our case, it is why building the swimming pool beside the original Magnolia Serene was not such a brilliant idea of ours. The tree was there first. (Magnolia Diary 13). Personally, I prefer the post-storm image of the original Magnolia Iolanthe (Magnolia Diary 9), planted beside our driveway although Lanarth (Magnolia Diary 4) dropping its petals more tidily and conveniently in our park is also a favourite. All this is a little premature this season as we are just entering the new magnolia flowering season – there should be a splendid display out by next weekend. And as a footnote, the petal drop around our lollipop Fairy Magnolia Blush is a regular delight still in store for this season as the first buds are just opening. (Magnolia Diary 12). This entry was posted in Tikorangi notes and tagged Abbie Jury, Fairy Magnolia Blush, Magnolia Iolanthe, Magnolia Lanarth, magnolia petal drop, Magnolia Serene, New Zealand magnolias, Tikorangi: The Jury garden, Tony Murrell on Radio Live on 21 August 2010 by Abbie Jury. The deciduous flowering is over for another year. On a grey day, it can seem a little forlorn. Fortunately, we have other strings to our bow so from here we move on to rhododendrons, and the bulbs are still in full flight. The michelias flower on, and on and on in fact – quieter performers than the deciduous magnolias but more staying power. In our park, our large Magnolia nitida is in flower, though all but enthusiasts may be a little underwhelmed by the modest yellowish inflorescence. We have it planted beside a very large talauma and a rather large Mangletia insignis (about 40 feet or 12 metres high) which makes an interesting group for dendrologists. 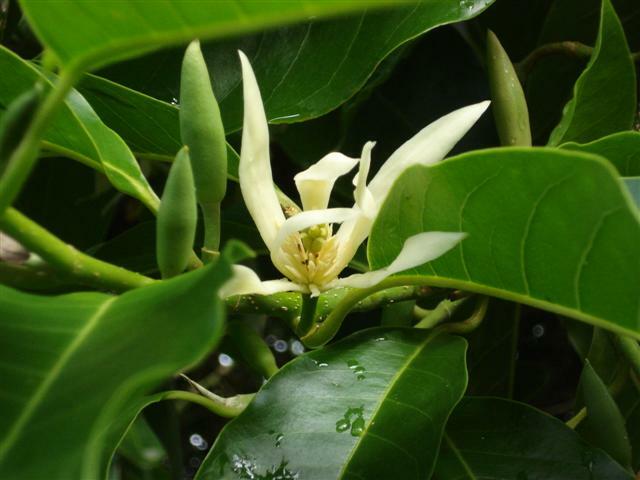 In summer we will return to this diary with some seasonal photos, including Michelia alba which we carefully planted by the swimming pool because its summer fragrance is divine. Alas it is so vigorous and it is gaining stature so quickly that we are wondering if we made a mistake. Finally, nothing to do with magnolias but this tui was not a happy camper yesterday. Our native tui feed on nectar and as it ferments, they can at times be found drunk and vulnerable. This one was wobbly, disoriented, land-bound and even retching. Fortunately tui seem to recover more quickly than humans and when we returned to check a few hours later, there was no evidence, either dead or alive. We hope this is a sign that he recovered sufficiently to fly to safety. 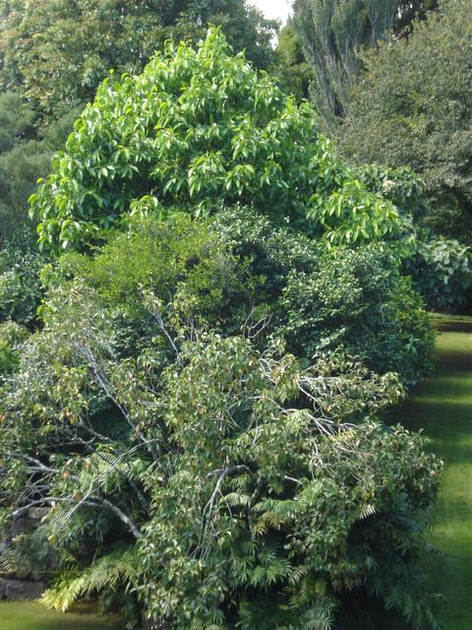 This entry was posted in Magnolia diary and tagged drunken tui, Magnolia nitida, Magnolia Serene, mangletia insignis, New Zealand magnolias, talauma on 29 September 2009 by Abbie Jury.